For a country with 2000 years of recorded history, many dates on the calendar are of special significance. For the nation, the 18th of June is remembered by all as the day in 1940 when General Charles De Gaulle, who had retreated to England, broadcast an unforgettable call to his people to persist in their fight against the Nazi invader. Our work later this week will focus largely on the terrible World Wars that ravaged this country in the 20th century. On the same score we are all still regretful about our failed trip to the Isle of Yeu this past Saturday. There we would have seen the prison and final resting place of De Gaulle's nemesis, Marshall Pétain. Pétain was the WW I hero who treated with the German occupier in 1940 and became the chief of the "French State". After the war he was tried for treason and sentenced to the guillotine. His sentence was commuted to exile, however, and the Isle of Yeu was chosen as his prison. The 18th of June also has a special place in the memory of WVU-V. It was one year ago today that our WVU-Vendéens traveled south to Bordeaux to meet the Blue and Gold Travelers and their hosts President and Mrs. David Hardesty. It was a weekend none will forget. The 18th of June 2001, is a truly special day for Dr. V. and me as well. 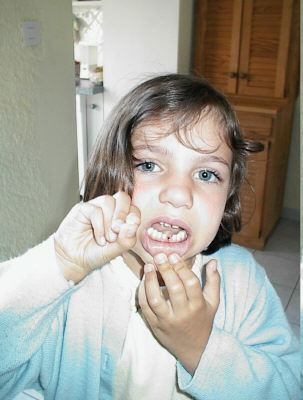 It is the day our youngest daughter Lucie lost her first tooth. In France it's not a fairy, but a little mouse that will pass tonight. Lucie can't wait to see what the mouse will leave for her under the pillow. Please send e-mail to Michael Lastinger to provide feedback about this page. This page last updated on 6/19/2001 8:18:33 PM.